Poodle skirts and bobbie socks, saddle shoes, pearl necklaces, tailored suits, cardigan sweaters, hats and handkerchiefs, wingtip shoes… The 1950s had a look all its own. Even the phones of the 1950s had a distinctive look, especially the Ericofon. The highly collectible Ericofon was a one-piece plastic phone made by Ericsson Telephone Company in Sweden. The dial was in its base, as was the mouthpiece. The Ericofon was also commonly called the Cobra Phone thanks to its silhouette, which resembled a cobra about to strike. All of the phone’s essential components were included in the one-piece phone. Though it was considered a one-piece telephone, early models had a separate, wall-mounted buzzer or ringer. At the time of the Ericsson Telephone debut, most phones were rotary cradle phones made from bakelite and offered in one color: black. Early marketing for the Ericsson Telephone noted that ‘The dial in the base “comes to you” for dialing ease in any position, angle or distance.’ Not only was its design striking and unlike any before it, the phone was available in a variety of colors, too. In fact, when the phone came to the North American market, it was available in 18 colors. The one-piece design appealed to hospitals. After all, patients lying in hospital beds needed a convenient way to use the telephone, and reaching over to a side table to dial a number on a two-piece phone wasn’t convenient nor ergonomic. 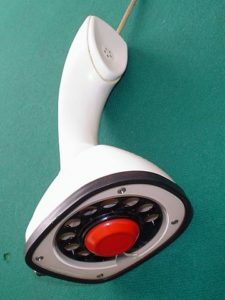 The Ericofon’s large red button in the middle of the dial served as the phone’s hook. When placed on a surface, the hook would naturally become depressed, thus ending the call. The three main versions of the Ericsson Telephone were a rotary dial version, a dial-free model (commonly used as extensions where dialing out was not permitted), and a touch-tone version. The touchtone model’s hookswitch was placed in the red horseshoe section of the base. This hookswitch is known to be fragile and prone to breakage, and it’s not easily repaired. In the mid-1950s, Bell Telephone had the American market to itself and initially prevented the Ericsson Telephone Company’s telephones from using their circuits. The company eventually allowed Ericofons into the market — for institutional use only. According to Ericofon.com, Bell Telephone still charged rent to Ericsson Telephone Company customers even though it was not the provider of the phone. Ericofons have appeared in movies and television including Mad Men, Men in Black, and Twilight Zone. Today, it’s considered highly collectible with prices currently ranging anywhere from $100 to several hundred dollars on eBay. Extremely rare models go for much more. “1956.” n.d. Accessed June 11, 2018. https://www.ericsson.com/en/about-us/history/products/the-telephones/the-ericofon–cobra-1956-1954. “Ericofon.” n.d. Accessed June 11, 2018. https://www.collectorsweekly.com/telephones/ericofon. “Ericofon Aka Cobra Phone, An Innovative Telephone Design by Ericsson.” n.d. Accessed June 11, 2018. https://laughingsquid.com/ericofon-aka-cobra-phone-an-innovative-telephone-design-by-ericsson/.